A bullet-hell shooter inspired by the Touhou games. I think this must be my favorite game made by you. I hope you’ll make a sequel for this, or maybe make a mobile version for it! A mobile version would be awesome! 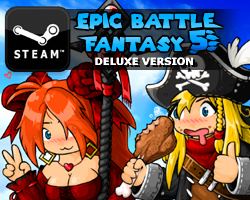 Reimu and Marisa for EBF5 MAKE IT HAPPEN! I AGREE SO FRIKIN MUCH! OR EVEN A LAST BOSS! OR EVEN AS MAIN CHARACTERS! or just the master spark in a easter egg attack? I’ve tried this game on two different computers, and they both have a glitch where when you complete a level, you can’t return back to the menu. Also, since I was bored, and like overdoing things, I came up with a ‘law enforcement’ challenge. No, I haven’t actually beaten the game, but I am playing through the thing using health cheats to see what it is like and where there are issues. problem: The challenge requires having a money/unlock all levels hack. I use arcadeprehacks for it, and it works really well since you choose which hacks to use. Other than that, it works very well. prep: use the money and all levels hacks right off the bat, as limits in this challenge make money and the bonus levels impossible to get otherwise. With the money, max out your standard attack and your movement speed. All others are off limits. First, you aren’t allowed to fire when an enemy is onscreen that will move off screen without you shooting it. Yep. constant enemy wave sections can be really buggery. The best part is that you also can’t fire when their bullets are onscreen either. Once they leave the screen, if any bullets they fired are still on screen, you can’t fire at the enemies staying on screen until those bullets leave. However, enemies that stay on screen until killed are fair game, and their bullets are not ‘private property’. The firing wave from enemies that stay on screen has to be in full swing before you are allowed to fire as well. Problems: the slime line in level 2. That shouldn’t be a problem. One life lost? Don’t be a baby. enemy ammo: the ones that can be fired at count as enemies with the exception of the tank shells in level 18, since those would keep you from ever killing the tanks. No, having bullets you already fired hit enemies when those get spawned doesn’t count against you. second: money and power ups count as instant kill bullets. You can’t fire while either are on screen, and if you accidentally pick one up. Oops. You just died. The reason why magnet is not an upgrade allowed. third: boss battle. When you finish a bullet pattern, you have to wait for that bullet pattern to completely leave and the next one to have hit the edge of the screen (bottom edge, and all types.) before you can continue firing. Yes, the money and hearts dropped are still instant kills. fourth: both bombs and sub attacks are off limits. Use either, you’ve just ‘broken the law’ and get to restart the level. Yes, its beatable. Went through the levels and it gets pretty tight, but a really good Bullet Heaven player can beat it. Just to ask kupo, could you make pacifist runs possible if you make a Bullet Heaven 2? Just a suggestion; make BH2 CAVE style. I’d love to see a DoDonPachi DOJ/SDOJ style sequel. A Ketsui style game is fine too! I S-Ranked all levels (except for Oblivion) and my cookies get deleted somehow (my other cookies were fine). Is there any way for us to download this? I’d like to play it offline but I can’t figure out SWF files. Thanks m8. I’ve been trying to find a way to make this playable offline, so that I can put it on my laptop via flash drive and take it with me, like I do with most of the other games. The versions I’ve been downloading, however, don’t advance past the first level; upon completing it or pausing the game, no option allows you to access the menu and continue. Is there any way to download entirely and make it playable offline? Or does it have to be made online? I don’t remember. It probably needs access to the internet, which is why it crashes offline. But if you change the Flashplayer settings to allow that, then *maybe* it’ll work. Maybe not. First of all, I consider it an honor if that’s who I think it is that responded to me, and if not, still a pleasure to receive a response at all. But let me clarify exactly what happens, since it’s not technically a crash. The link that Linkzenken provided (http://external.kongregate-games.com/gamez/0010/8868/live/embeddable_108868.swf specifically), I attempt to play from the browser as is. I go through the first level, and at the end, when given the option to retry or move on, it allows either, having saved my progress. I close the link, and open it back up, just to make sure I’m not smoking crack, and sure enough, the progress has been saved. Perfectly allowed to move on to the next level, or retry, and when I pause, allowed to take both options as well. I’m using Firefox, or what I believe to be the most stable version of it, so I may need an update. But I attempt to save the webpage, and then open the .swf file that was produced, and at first notice that, unlike with the link provided earlier, the .swf I downloaded has the top right corner of the screen blackened out. It still allows me to start the game, though another difference comes with the links to the other games and facebooks not doing anything. Same with the other version that have been downloaded, I mean of Epic Battle Fantasy 2, 3, and Adventure Story, in that outward links don’t seem to be able to load, so I assumed that had nothing to do with it. The kicker comes from when I enter a level. If I press the pause button, neither retry nor menu take me out, though they do make noise as if I pressed them. I’m allowed to unpause, assuming the level hasn’t finished or I die, and continue playing as if everything is normal. But once that final menu pops up (either because of a death or ending the level), the only two options are retry or menu, and neither seem to be able to function. Just to test to see if that’s really how it is, I quickly repeated the same steps with the Epic Battle Fantasy 3 provided on this site, and it seems to save my progress just fine, which makes me think it only happens with Bullet Heaven. If that’s the case, then I’ll just accept it, but if not, it’d be cool to know a way around or if I was doing something wrong. 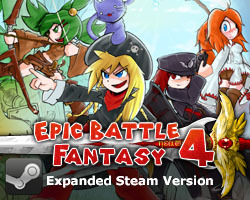 I’d also like to note, if this is who I think it is, that I wish you had a Patreon so I could make it the first one I support, I’m going to save up to purchase each digital soundtrack, and I intend to buy the Steam Version of Epic Battle Fantasy 4. It’s good to finally be able to get a job and pay for things you liked growing up, and Epic Battle Fantasy 3 especially was a fun distraction from the frustrations of my first year of college. Yeah, I have no idea what’s wrong. I really don’t remember much about the game. Fair enough. For someone so talented to still allow his early (yet still amazing) productions to be free, I can’t complain if one requires an internet connection, I suppose. Thank you for the response at all! I was serious about the Patreon bit, if you think you might look into doing something like that, though. Aaaaaand I’ve already started a heavenly playthrough of BH2. Because what’s better than being pissed off trying to beat one game? Being pissed off trying to bet an even harder game on the hardest possible difficulty when it already took me about 40 attempts to beat the final boss on hard mode. Yay, masochism! I need more coffee. (That times about a hundred) Perfect.